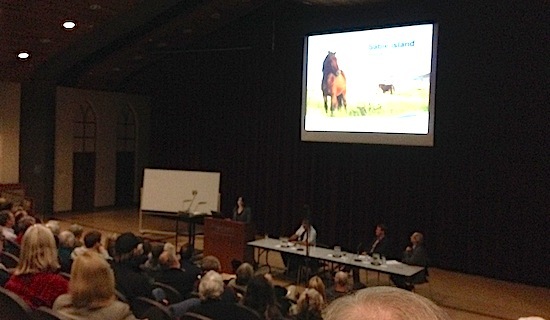 The three Parks Canada bureaucrats who tag-teamed an illustrated talk at tonight’s ninth annual Sable Island Update faced a skeptical, though not overtly hostile, audience. The first time Canadians heard about plans to turn Sable Island into a National Park, Jim Prentice, environment minister at the time, launched into an addle-pated discourse on how great a park would be for private businesses that could could ferry boatloads of tourists out to Sable and put them up for the night in hotels. You want to hope this was a spontaneous outburst by a know-nothing minister, but with Harper’s crew, who can be sure? Parks Canada bureaucrats have struggled ever since to convince Sable’s large, passionate constituency that they are not the advance guard for a mob of gun-toting Reform Party vandals bent on paving Sable and putting up Ferris wheels. In her talk last night, Zoe, who is principal organizer of the meeting, gave her usual fascinating and witty précis of events on Sable over the last 18 months—a spell-binding catalog of weather highlights, scientific discoveries, critter strandings, beach debris, and whatnot. She followed this with a useful history of tourism to the island, gently driving home the point that people have always visited Sable (albeit in small numbers) and properly managed, such visits cause little damage while helping build the passionate constituency for conservation that is Sable’s best protection from Cretins like Prentice. Zoe and I have not spoken about this, but it appeared to me that she and the Parks Canada officials charged with setting up the new park have established a productive and mutually respectful relationship. This has not always been the case. Zoe is a woman of strong views and a willingness to express them. She has not always enjoyed a blissful rapport with Sable’s federal overseers. 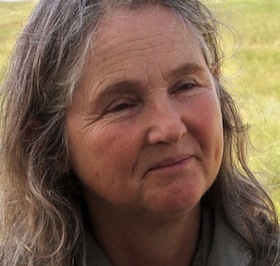 In their presentation, the Parks Canada officials made the obligatory gestures you would expect toward Zoe’s revered role as unofficial steward of the island, including the invaluable scientific work she has carried out over nearly four decades. Beyond that, they peppered their inventory of preparations for park status with signals they have been listening, and thinking about imaginative ways to fulfill Parks Canada’s mandate to provide visitor opportunities without wrecking the place. Two small examples: They hope to get Google to carry out Street View mapping of the island, so Sable buffs can treat themselves to virtual tours from the comfort of their living rooms. When challenged about regulations that ban petroleum drilling on the island, but permit seismic testing, they agreed with a marine geologist in the audience that sufficient seismic testing has already been carried out, and it’s unlikely future tests would be permitted. I don’t want to go overboard here. The trio of officials did sometimes lapse into practiced talking points whose purpose was to mollify, rather than inform. They professed not to remember what the park’s annual budget was, but when pressed (by me) they agreed to give Zoe this information for publication on her Green Horse Society website (specifically, the park’s 2013-2014 annual budget, and the annual operating budget they expect once startup costs are behind them). I’m no @Tim_Bousquet, but I did my best to live-tweet the event. With occasional help from seat-mate Alan Ruffman, I think I did capture the gist of most, if not all, the questions. You can find these tweets by searching for my Twitter handle (@kempthead) or the hashtag #Sable. Those outside the Twitter realm can view the live-tweets in bullet form after the jump. If you are unfamiliar with Twitter, reading from the bottom up will give you my account in chronological order. Errors and omissions are mine. #Sable Update Session is wrapping up. Who will win the door prizes? Q: (by me) ask again, what is the budget? A: we will provide Zoe with the numbers on Green Horse Society website. A: (cont.) DFO has ecosystem responsibility but they would require a permit from us. A: the board would ask that question of any applicant b/c we agree that the work to date seems sufficient. Q: What does PC consider the visitor carrying capacity to be? A: to be determined as part of the management plan. Q: what happened to plan for wind power? A: challenging environment for wind. Reviewing all options but esp. green options. Q: how much is the budget? A: Don’t know (!) exact number. Q: is plastic debris a cultural resource? A: Ambiguous. PC will determine what is a cultural resource. Also seeking ways to enable people on the mainland to experience #Sable through things like Google Street View. Looking at ways to give a limited number of people #Sable experience, leave “only footprints,” and become ambassadors. 70 visitors in 2012. 94 so far in 2013. Parks Canada will reduce the footprint of the #Sable base station with more efficient energy production and fewer heated spaces. Shepard reviews visitor management systems — mandatory permitting, orientation. About 250 people are attending #Sable update meeting tonight. National Park “Reserve” reflects unsettled Mi’kmaq land claim. Zoe recounts many reasons people have visited #Sable over the years. Zoe credits Parks Canada with cataloging material artifacts for the first time. Balloons recovered from New Jersey and Indiana. Also a greater shearwater killed by balloon cord. 1987 to 2011 #Sable horse pop varied from 150 to 400 but only 50 animals were contributing DNA to next gen. Concerningly small number. Recently, Frasier has added genetic analysis to this field data of #Sable horses.